Remove yellow/orange from blonde hair. 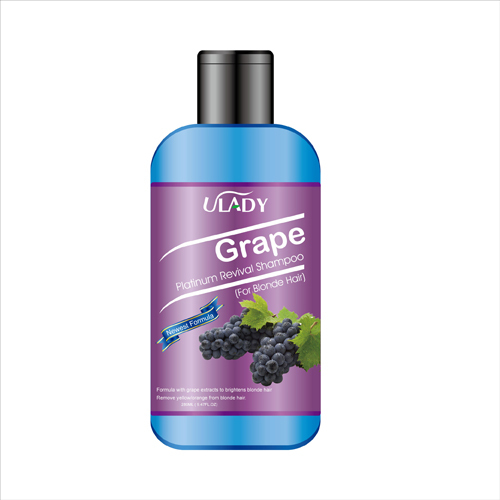 Shampoo specifically formulated with grape extracts to emphasize color in damaged & bleached hair. Restores natural color to lightly beached, blonde, or gray hair. Designed to remove yellow and green tints, restoring vibrancy to your hair. Ideal for enhancing highlights. Protect blonde hair from changing to yellow, and brighten natural blonde without hair dying. Usage: Apply suitable amount to wet hair, massage into rich lather, rinse thoroughly. Do not overuse it. Recommend to use 1-2 times per week.